Though I have never considered myself particularly oriented toward visuals, in recent years I have come to appreciate the value of mapping from both a teaching, learning, and productivity perspective. If you haven’t explored how mapping might help enhance your work, I would encourage you to take a closer look at concept and mind maps. Both are visual representations of knowledge and ideas. Concept maps are traditionally more structured and hierarchical in terms of organization, with the most general concept at the top and the more specific concepts at the bottom (Nilson, 2010). The links between the concepts should also be meaningfully labeled. Here is a sample concept map  on concept maps. “Using Concept Maps? ” from the Eberly Center at Carnegie Mellon also gives good instructions on how to create and assess concept maps. Mind maps are less structured, but generally have the main idea at the center of the image, with themes radiating from this central idea (mindmapping.com , 2016). Mind maps can also include media, such as images or videos, in addition to text. Here is a sample mind map  of guidelines for mind mapping. As a teaching tool: consider creating a map as a way to help students understand the structure of the day’s topic or even an entire course. On the first day of class, I show students a concept map I have drawn of the course and then use that map to explain the course structure and syllabus. As a learning tool: have students refine or demonstrate their learning by creating their own maps around a given topic or the course. Note: because students can be uncomfortable with ambiguity (there’s no one “right” map), this might require a good amount of coaching and guidance from you. See how this teacher  uses mapping to generate student discussions and assess learning. As an assessment tool: maps can be a great way for students to demonstrate their learning in the course. Just be sure to give students clear guidelines for developing their maps (and lots of practice creating maps beforehand) and consider creating a rubric. As a course design tool: if you’re designing a new course (or doing a major revision of a current course), consider first creating a map to help you generate your learning outcomes and key content areas. As a writing tool: Mapping can also be a great way to organize your ideas for a paper. As a notetaking tool: Recently, mapping and sketchnoting  have become popular methods for taking notes at conferences. I now take notes at conferences this way and have also extended this practice to creating sketchnotes for books while I am reading them. Center for Instructional Innovation and Assessment (2008). 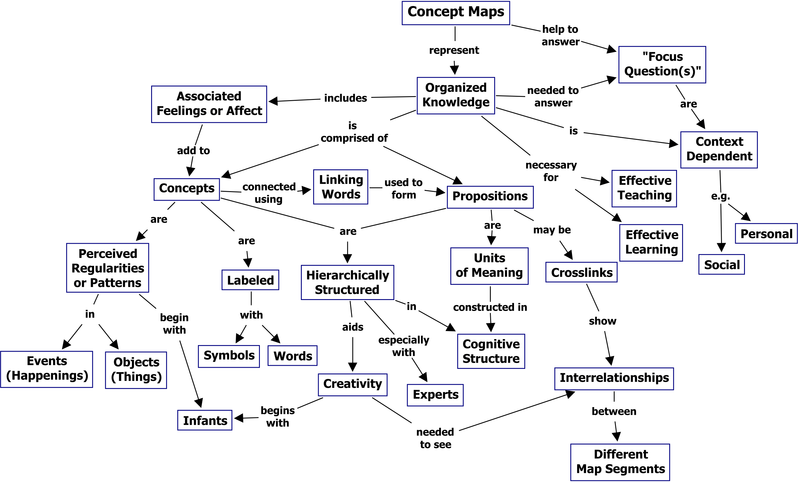 Classroom assessment technique: Concept maps. Retrieved June 30, 2016 from: https://youtu.be/Gm1owf0uGFM . Eberly Center for Teaching Excellence. (2016). What are concept maps. Retrieved June 30, 2016. Mindmapping.com. (2016). Theory behind mind maps. Retrieved June 30, 2016 from: http://www.mindmapping.com/theory-behind-mind-maps.php . Nilson, L. B. (2010). Concept Maps. In Teaching at Its Best (3rd ed.). San Francisco, CA: Jossey-Bass. Schrock, K. (2016). Sketchnoting in the classroom. Retrieved June 30, 2016 from: http://www.schrockguide.net/sketchnoting.html .